As a little girl, Sarita Dua was a bit of a math and science geek, always finishing her assignments first in class and at times hiding how easy she found it, so as to avoid teasing. By the time she was nine, she was teaching computers to kindergartners. 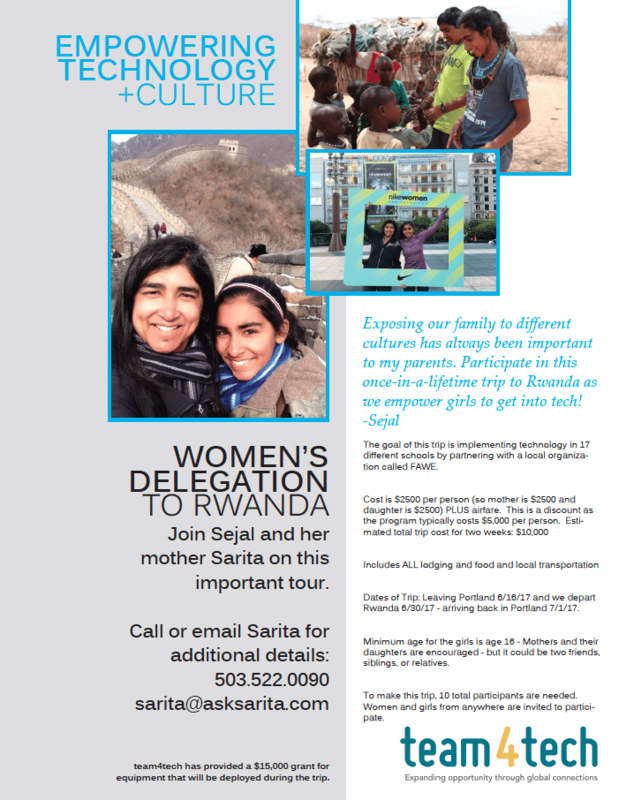 Now a successful principal broker at Keller Williams in Portland, Oregon, Dua is taking her teen daughter, Sejal, to Rwanda in a mother-daughter service project to help advance girls in science, technology, engineering and math (STEM). The project, which Sarita and Sejal formed together, seeks to advance STEM education to girls in 17 secondary schools in Rwanda, and is being done in coordination with Team4Tech, an organization which works to advance the quality of education in developing countries by connecting technology volunteers and solutions with high-impact nonprofit organizations. For the project to work, Sarita needs other mothers (or grandmothers) and daughters to join her with vacancies for six spots currently. Due to the nature of the two week trip, which is scheduled from June 16 through July 1, girls must be over 16. Any combination of women, including grandmothers who are tech savvy, are encouraged to participate as part of the delegation. Cost is $2,500 per person, and you don’t have to be from Portland to participate, said Sarita. It will be an immersive process where participants deploy technology and teach students and teachers how to use it. Team4Tech has provided a $15,000 grant for the equipment that will be donated to the schools. Sarita feels this effort will serve to bring daughters closer to their parents. “Ironically, while some technology can separate us in a vacuum through texts and social media, it is exciting when technology can bring a community together in a meaningful way. This project does just that, and helps underscore what it means to be part of a global community,” Sarita said. The Portland broker said she has found her “why” with this initiative. “The thing is, you have to have a reason we do this crazy gig,” she told Inman. “Sure, we all love the money, the freedom, the entrepreneurial spirit. We sell houses, we help people. Blah blah blah. I get it. “But for me, I have to admit I do love all those things, but I needed to have a reason to spend even 43 minutes on a Saturday away from my family. That reason used to be my family. I did this all for them and our goals. And to some extent it still is. But now, after 14 years, it is something even more. “I started asking myself, what are those causes that I want to have an impact? What are those areas where I want to make a difference? “It became clear to me that my ‘why,’ my cause that I care about, is to get girls excited about STEM.